Here is all that left, I do have the original wheels too! Like I said this will be a long running thread, probably wont be up and running until the summer. So share your stories, tips, pictures, and recommendations! Looks promising! I am looking forward to seeing it built up, but also to enjoying the journey, too. I bought a marvellous Astute/Super Astute/Madcap hybrid from you, but sadly I had neither the funds nor appreciation to support such a competent buggy. The times I did have with it, though, I marvelled at its straight-line speed and sure-footed handling. I loved it even more once I dropped in a genuine TTC and a 13T brushed motor! I knew by then, though, that it would be wasted on a casual driver like me, so I moved it on. I still have a few regrets, but if I wanted to return to it, the window is open a crack with the 2018 Super Astute re-release. I believe that glorious hybrid is now in the hands of TC member Ann3x, although I have not seen it since. @Grastens That Astute was/is one of my favorite buggies on this ENTIRE site in the 15 years I've been here. Everything about that color scheme and buggy stance works beautifully. The below Astute is running the original Astute gearbox from Grastens car above, when I received this one GTodd there was far less of it left than yours, it took a while but I didn't spend big on it either, nearly everything was second hand and forum bought. Blitzer Beetle rear hubs with spacers iirc will allow the install of Top Force unis….. If those hubs allow top force unis to work the latest modern df02 universals will also fit. I have a set on the front of my Thunder Dragon where BITD the Terra Scorcher used Top Force style shaft. The DF02 come as a pair and are a little cheaper. Looks great, glad to see you keeping ball diff, they are not as fragile as internet lore over the years has made them in normal usage. They require a little more maintenance perhaps and don't throw a 5.5T brushless at it and it will be fine. Reading the internet I believed a runner Top Force I recently built would grenade the ball diff's if I looked at it wrong, I've been running that car on black carpet traction with 13.5T brushless and no issues at least after 8 hard battery packs. I was wondering what happened to that Astute, Im glad you enjoyed it Grastens. I had a shelfer with Hicaps I sold on here too, I wonder what became of that one? I sold those off because I had just purchased a 12' Mustang GT and needed money for upgrades. The money went toward Koni Adjustable shocks, Ford Racing Springs, Eibach swaybars, and different lower control arms. Since then Ive added 6 piston big brakes and a blower :) . This Astute will be ran with a Ball Differential I rebuilt (AGAIN) with three different ball differentials, and an AVANTE gear differential!!! Here is how the Avante differential looks. Its a little long and needs trimming to fit in the Astute gearbox. Once trimmed it drops right in, a little sanding is needed and then viola, geared differential option! Doesn’t the Avante geared diff centre have an extra tooth compared to the Astute? I believe that glorious hybrid is now in the hands of TC member Ann3x, although I have not seen it since. I still have it, although I swapped out the shell (not my colours). Not sure, runs smooth when I bench tested it. Dropped right in and sealed up. Great project and thread, I'm following with interest and loving all of this recent Astute content which has got me back in the shed building again. The Super Astute re-release has allowed me to rationalise my fleet too, meaning that all of my vintage original Astute parts can go towards OG Astute restorations for the shelf and the runners are getting all the re-release and Hop-Up parts. 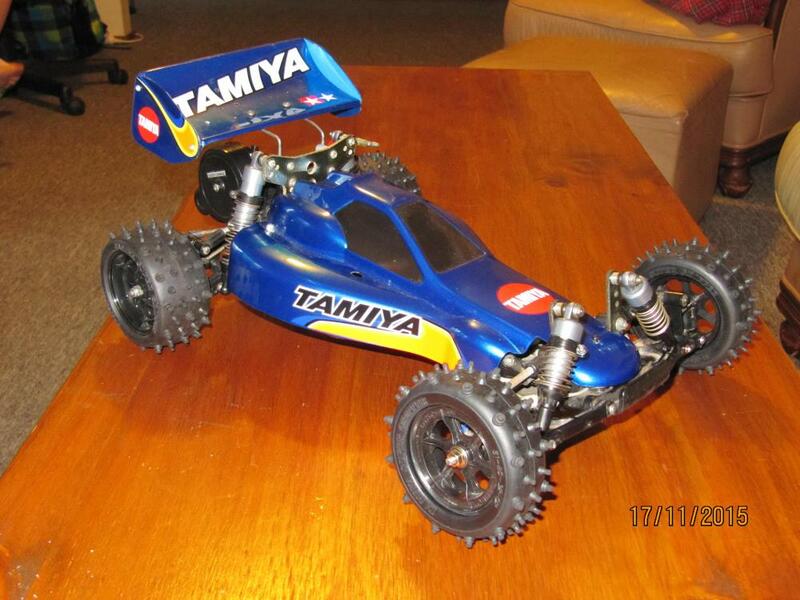 This pic is from 2011 when I recovered my very first Tamiya from a family member, 20 years after I had sold it. The car had been through at least 3 sets of hands when I tracked it down. I first rebuilt it as a runner, then restored it to box art however last year I realised that this car meant more to me as a window to my 15 yr old self. That prompted me to restore it back to exactly how it was, as per my very first build. I restored the original blue body and wing, rebuilt and fitted the 16 x 2 Mega Motor and fitted all vintage Futaba electrics. No reveal pics just yet though, I want to get a couple of other resto's finished first ! OK, all I really know is that a few years ago I bought a Avante Ball diff hop up set which I planned to use in my Astute but Kontemax from here said it wouldn't work as it had an extra tooth, although the pitch is correct. What exact part # bags does one need to piece together said Avante differential? I'll look it up for you when I get home. I ordered the parts for the Avante Center Ball differential and it came with all the required parts for two gear differentials minus the uber tiny screws to secure the differential halves. 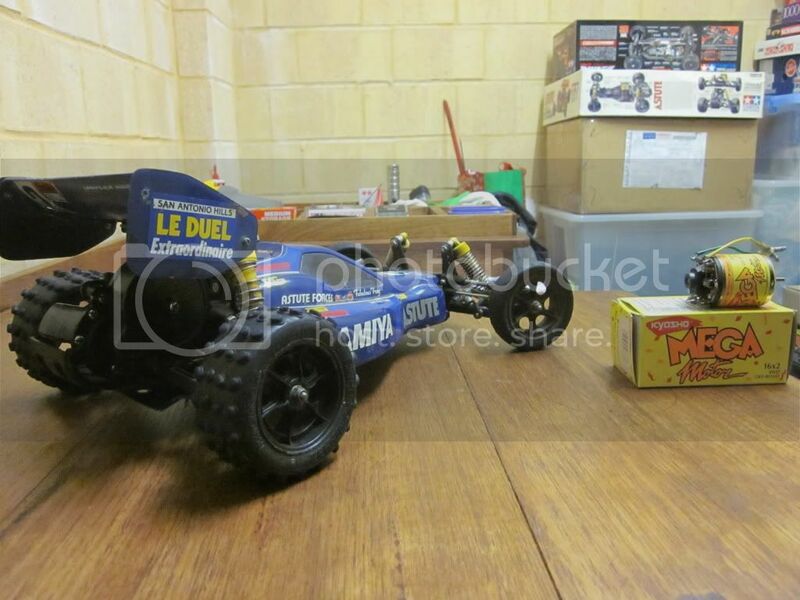 This coming weekend I'll swap this transmission into my brushless Monster Racer to see how it performs. The monster racer is running the stealth transmission conversion which is AMAZING by the way. Little update on the way today. Right now I have a realest. Anyone have the hardware for the front sway bar? I thought I still had it, nope, gone. PS one of the sub chassis screws are stripped on my monster racer and to be honest I didn't feel like dealing with it so I haven't tested the gear differential yet. I found an old stash of ball differential parts so the ball differential.is ready to go again as well. Sorry for the delay. I stripped the old girl, sorted the parts, and then boiled them. I learned from my 801XT that boiling the parts will make them less bristle. Seeing how I'm re-using all the parts including the well known fragile parts and uber rare suspension arms this was an important step as I'm going to run this in my yard and the track occasionally. What started as a simple sort of parts wound up as a complete dry build, I got carried away seeing what original parts I still had. I'm missing a few parts such as the aluminum stanchions for the trans mount, I had extras of the other style they'll do for now. "Dry" because I'm going to go all out and get ball bearing to replace ALL the brass bushings, and Ill have to blow it apart again. The only new item on the chassis right now are the hornet kingpins. They are the exact same as the super Astute ones but they only cost me $5 shipped compared to the $24 every one is asking for the SA ones. This week I ordered the stadium blitzer hubs part tree which also come with front upright and rear suspension mounts which is key as Im not expecting the originals D parts to last long, boiled or not. ALL the press nuts on the chassis were replaced with black lock nuts. Next pay check Aeration Dampers! LOTS still to be done!!!!!!!! See the red paint on the transmission cover? That's from me when I was about 12 trying to fix a scratch on the body by painting it on the outside (! ), with the body still on it. I won't be fixing that! Oh wow!!!!! I just read this! I'd love the rear hubs carriers! How do I find you on shape ways? ....PS yes to the front knuckles!!!! I learned from my 801XT that boiling the parts will make them less bristle. Seeing how I'm re-using all the parts including the well known fragile parts and uber rare suspension arms this was an important step as I'm going to run this in my yard and the track occasionally. Just as an aside, if the parts you do this to are originally white or uncoloured, if you add fabric dye to the boiling water you can make your boiled parts turn different colours. More parts arrived, update today. The stadium blitzer hubs arrived and they were promptly installed. I was concerned that the stock Astute drive shafts and axles wouldn't fit based on what I read, there are not fitment issues what so ever. I did have to trim the hubs a bit. There are "ears" on the hubs where the rod ends attach, the ears had to be removed, no big deal. A few seconds with a dremel made everything flush. PERFECT fit. This combination offers zero degrees of toe in, seeing how these cars were cursed with understeer a little less rear end traction should make things a little more neutral. More in a bit, bed time for the kids. Forgot to add, Installed my old top force shocks to check and ensure that the suspension moved freely and to see if I could get bigger than stock shocks to fit up front with out a bigger shock tower, I could! More in a bit.